Below are recommended lenses for Nikon D7500 DSLR camera. 35mm, 50mm lenses are the most popular prime lenses for Nikon D7500. The new released Sigma 50mm f/1.4 DG HSM Art lens and Sigma 35mm f/1.4 DG HSM Art lens are of course the best prime lenses for Nikon D7500, but the price is not cheap. The AF NIKKOR 50mm f/1.4D and AF-S DX Nikkor 35mm f/1.8G are great lenses at a very cheap price. Other recommended lenses are Sigma 50mm f/1.4 EX DG HSM lens and AF-S NIKKOR 50mm f/1.4 G lens. There are a lot of good standard zoom lenses for Nikon D7500 DSLR camera. The best 24-70mm lens is Tamron SP 24-70mm f/2.8 DI VC USD lens, this lens is cheaper than AF-S NIKKOR 24-70mm f/2.8G ED lens, but image quality is better. If you looking for a cheap lens, there also some good choices: AF-S NIKKOR 24-85mm f/3.5-4.5G ED VR, AF-S DX NIKKOR 18-140mm f/3.5-5.6G ED VR and AF-S DX NIKKOR 16-85mm f/3.5-5.6G ED VR. If you are looking for a wide-angle prime lenses, the Sigma 24mm F1.4 DG HSM A lens is the best chocie. For cheap lenses, the AF-S NIKKOR 20mm f/1.8G ED and AF-S NIKKOR 28mm f/1.8G are both good wide-angle prime lenses for Nikon D7500. From the list, it is clear that the Sigma 18-35mm f/1.8 DC HSM lens is the best wide-angle lens, even better than AF-S DX NIKKOR 17-55mm f/2.8G ED-IF lens. The Tokina 11-20mm and 12-28mm wide-angle zoom lenses are cheap and great lenses for Nikon D7500. Below are top rated 70-200mm telephoto zoom lenses for Nikon D7500 camera, the best ones are also from Nikon and Tamron, Tamron SP 70-200mm f/2.8 is much cheaper than AF-S Nikkor 70-200mm f/2.8G, but also has great image quality. 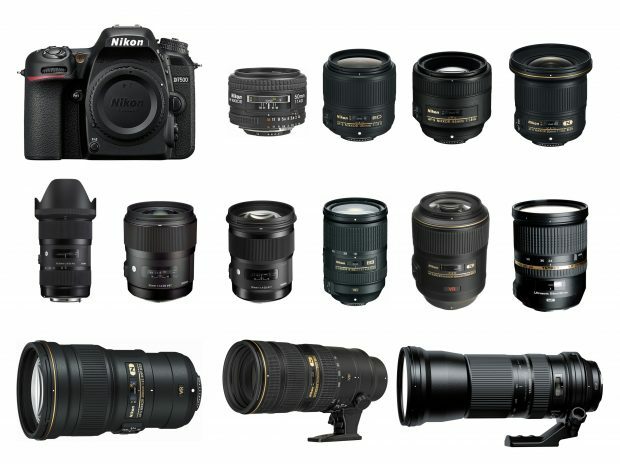 If you are looking for a cheap telephoto zoom lens, AF-S VR Zoom Nikkor 70-300mm f/4.5-5.6G IF-ED is your best choice. The Sigma 150-600mm and Tamron 150-600mm are both super telephoto zoom lens for Nikon D7500. If you are looking for an all-in-one zoom lens for your Nikon D7500, the AF-S DX 18-300mm is the best. The Sigma 18-300mm and Tamron 16-300mm are also both good lens with a cheaper price. If you are looking for a Macro lens for Nikon D7500. Below are top choices for you. Of course the best one is AF-S VR Micro-NIKKOR 105mm f/2.8G lens. If you are looking for a cheap lens, the AF-S 60mm f/2.8G ED and AF-S 40mm f/2.8G are both great macro lenses for Nikon D7500. Next Next post: Nikon D7500 Body now In Stock and Shipping !